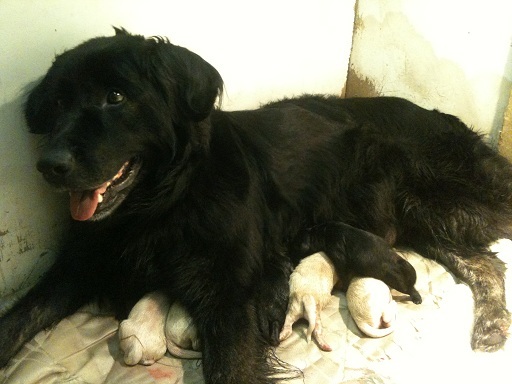 Judy and Eli’s pups arrived last night! First one like Eli, then the second like Judy, and so it alternated all evening, one boy after another until 2 little black girls were born just after midnight. Final number – 9 – 5 black, 4 blonde. Here are the first pictures taken at about 2am this morning. Watch this space for new pics as the pups grow. We have a puppy from the last mating of Judy and Eli and he is now 14 months old and the absolote image of his mum. His name is Sam and he is the most adorable dog we have ever owned! He has a fantastic temperament, friendly, and so clever (sometimes too clever!!). He sailed through obedience classes up to gold standard with no trouble. Well done guys, you’re a credit to breeders everywhere. If only more of them thought as much of their dogs and what the consequences of their matings would be there wouldn’t be so many “health problems” with puppies. You are always careful with whome you rehome your puppies with and are always interested in updates and keeping in touch with their progress. If anyone out there is looking for a perfect puppy we can highly recommend these guys! – And of course their puppies!!! Can’t wait for the next pics! !